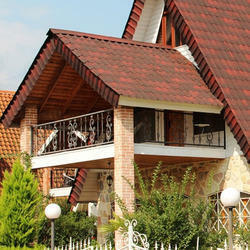 Our product range includes a wide range of onduvilla roofing tiles. Owing to the wide experience of this domain, we are instrumental in offering Onduvilla Roofing Tiles. Onduvilla corrugated tiles are designed to give roofs a pleasant look reminiscent of traditional clay tiles, while at the same time being extremely light. Onduvilla tiles have a unique colorings system, wherein each tile is different from others thereby resulting in a natural texture. Available in seven different colors. Available in a range of environmentally sensitive colour.